Masking Films - Daiwakaseishoji Co.,Ltd. In production line of precision instrument, masking film is used for many purposes. Production technicians use masking film in many cases in order to protect semi-finished and finished product from scratch and dirt. In addition to scratch and dirt, recently production technicians need pay attention to static electricity. We have developed anti-static masking film through exchange with technicians. Comsumption quantity of masking film protecting the surface of products has increased in line with growth of electronics, optical materials, and automobile industry. Especially due to the recent increase in high value added products, to prevent scratch and stain is required. There are much demand for masking film in semi-finished product and finished product. Stable quality is required for masking film. By making the most of our knowledge, we have been developing masking film through our own film procution technology. Generally masking film is film which protects the furface of plastic sheet (PMMA, PC and etc), aluminum sheet, SUS sheet, glass sheet, color steel sheet, aluminum sash, car body, optical product (disply and so on) and so on. And masking film is used to prevent scratch, dust, stain, corrosion and so on in transportation, storage and fabrication. Mainly there are 2 types in protection film, one is 「adhesive coated type」on which adhesive is coated, the other is「self adhesive type」which is produced by resin co-extrusion technology. ○Roll length is basic length, and other roll length can be discussed. ○Basically paper core is used, but we can use plastic core too. 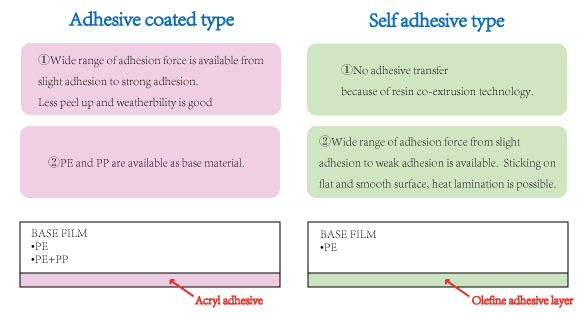 ○Adhesion force is reference value to choose suitable product, not guaranteed value. ○Adhesion force changes very much depending on the kind of adherend, surface condition. So please be sure to evaluate our masking film carefully at your side.